I am loving this hairstyle right now. It’s great for weddings, a night out, or even a cute day look. 1. Part your hair down the middle and separate into two sections. Braid each section starting just below the ear. 2. Secure the ends of braids with a clear rubber band. 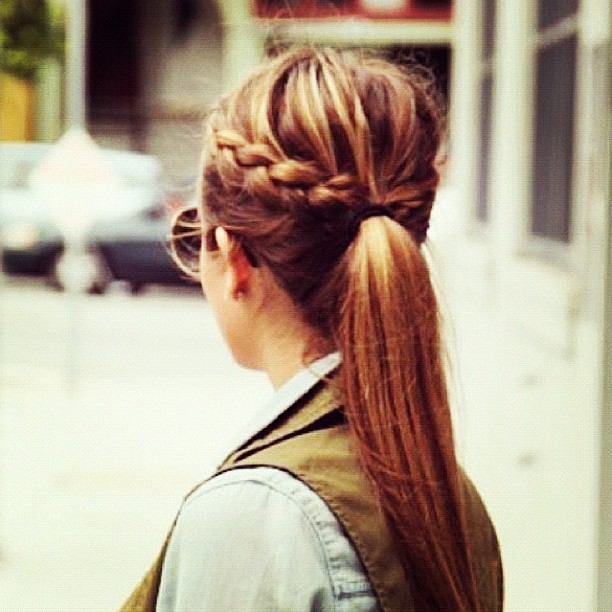 Once two braids are securely fastened, take out a few strands of hair out by your face so the look isn’t too perfect. 3. Take one braid and pull it tautly up & across the top of your head. Use bobby pins to secure the braid. Then do the same on the other side. 4. Curl or straighten your bangs to finish the look! This look is so cute & really adds a little style to your average pony tail. The best way to get this look is to first section off your hair from the top half (any hair above ears) and clip up. Then put a hair tie around the bottom half (just to keep it contained). Then take down the top half and do a braid on either the left or right side starting around the top of your head, braid all the way down to end of the section. Then bobby pin or use a rubber band to secure the end of the braid, JUST while you grab the bottom half of your hair, and incorporate it with the top. Try it out!